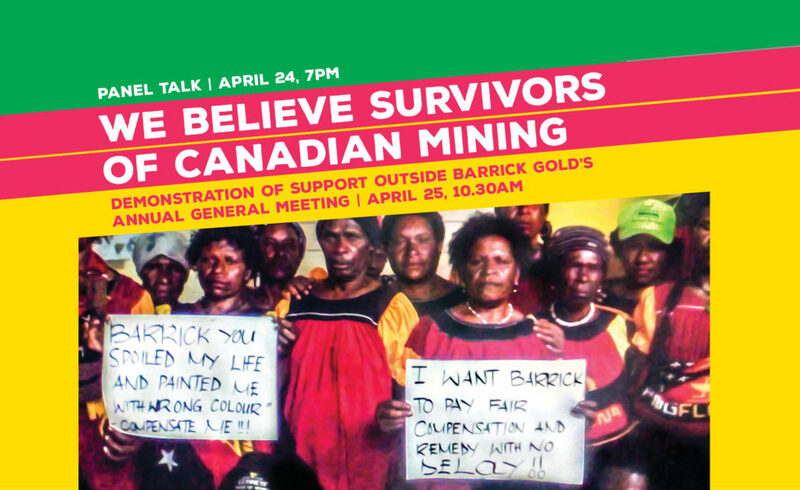 April 25, 10:30am: Barrick AGM Protest, 255 Front St.
Every year, we gather outside of the Annual General Meeting of Canadian mining giant Barrick gold, to amplify the voices of those directly impacted by their operations globally. This year, we are shining the spotlight on gendered violence at Barrick’s mines, by highlighting and supporting survivors of sexual assault. This year, come to hear updates of the struggles against Barrick’s abuses at mine sites around the world, with a special focus on women-led organizing. On the night before the demonstration, join us and Silence is Violence – University of Toronto for We Believe Survivors of Canadian Mining as we take an international, national, and very personal look at violence against women, as we find solidarity in the similarity of these struggles. From gaslighting tactics, to the cultural and legal barriers that prevent women from sharing their stories, we will look at the systemic forces that work to silence victims of abuse. We will also hear from courageous women who have stood up for themselves and self-organized with other survivors to tell their stories and demand accountability. Toronto, Canadá: PDAC, la convención minera más grande del mundo, inició hoy su 85 evento anual en Toronto. En respuesta al pedido de la Asociación de Prospectores y Desarrolladores de Canadá (PDAC) de ideas innovadores para #InterrumpirlaMinería (en Ingles #DisruptMining), más de un centenar de personas participaron en un tour de “Toronto Toxico” de la ciudad organizado por la Red de Solidaridad contra la Injusticia Minera (En ingles: Mining Injustice Solidarity Network, MISN). El viaje en autobús termino con una manifestación en el lugar de la convención, donde las declaraciones fueron compartidas por comunidades de todo el mundo, afectadas por las empresas que exhiben dentro de la convención. Decenas de participantes del tour también aprovecharon la oportunidad para asistir a la PDAC, usando camisetas que promueven la importancia del consentimiento de la comunidad acerca de los proyectos mineros canadienses. Muchos/as fueron echados/a rápidamente – o ni siquiera se les permitió ingresar en las instalaciones. Aparentemente, esta no fue la interrupción que buscaba la PDAC. This year, we intervened in PDAC, the world’s largest mining convention in a number of ways! We held a panel event entitled “Belly of the Beast: A Biopsy of TO’s Mining & Financial Sectors” Click here to watch video footage of the panelists’ presentations! We organized a Toxic Toronto bus tour ending with a rally at PDAC. Video of rally available here and video of bus tour available here. We collaborated with allies in Ecuador, including YASunidos Cuenca, who held a simultaneous solidarity action to counter Ecuador’s narrative at PDAC. We intervened in “Ecuador Day” at PDAC, delivering a letter signed by over 20 Ecuadorian organizations condemning mining. We responded to the #DisruptMining competition sponsored by Goldcorp by delivering our own ideas on how to truly disrupt mining to Goldcorp’s booth at PDAC. Video here. We delivered the “Pay Up and Pack Up” letter signed by 280 organisations worldwide to OceanaGold at PDAC. Video here. Toronto, Canada: PDAC, the largest mining convention in the world, kicked off its 85th annual event in Toronto today. 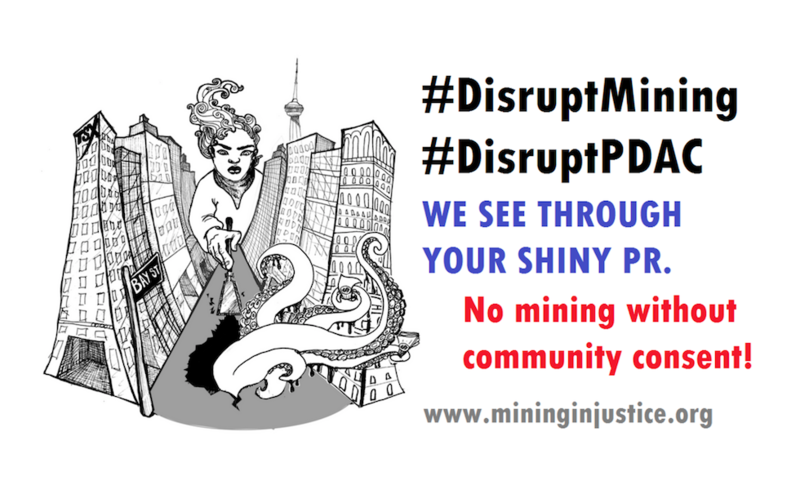 In response to the Prospectors and Developers Association of Canada’s (PDAC) call for innovative ideas to #DisruptMining, over a hundred people participated in a ‘Toxic Toronto’ tour of the city organized by the Mining Injustice Solidarity Network. The bus tour ended with a rally at the convention site, where statements were shared from communities around the world impacted by the companies exhibiting inside the convention. Dozens of tour participants also took the opportunity to attend PDAC wearing shirts promoting the importance of community consent near Canadian mining projects. Many were quickly ejected – or not even allowed to enter the premises. 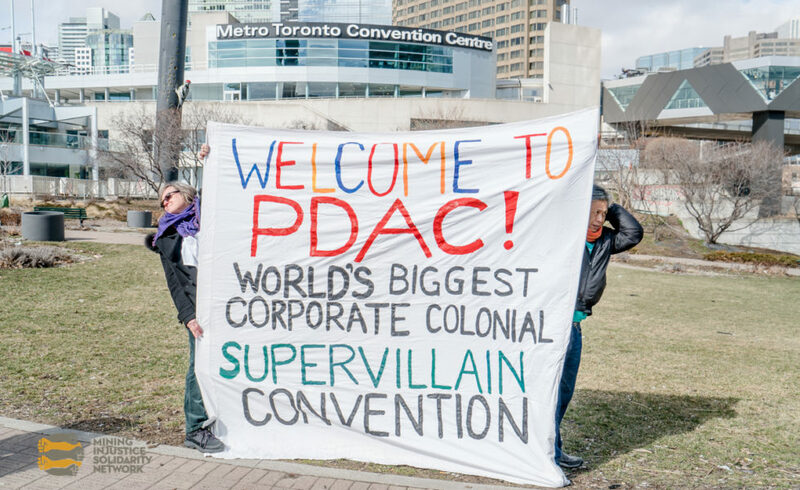 Apparently, this was not the disruption PDAC was looking for. 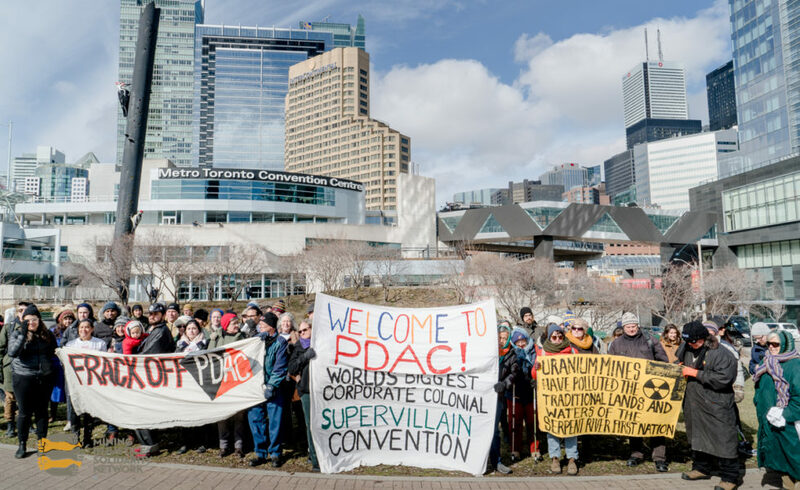 The Prospectors and Developers Association of Canada (PDAC), organizes the world’s largest mining convention every year in Toronto in March and carries out lobbying efforts in favour of the Canadian mining industry throughout the rest of the year. They describe themself as “the leading voice of the mineral exploration and development community” and claim to encourage “best practices in technical, operational, environmental, safety and social performance”. Meanwhile, Canadian mining companies are far and away the worst offenders in environmental, human rights and other abuses around the world (according to a global study commissioned by PDAC itself but never made public). The PDAC convention is dedicated to telling compelling stories about the mining industry’s successes and innovations, especially in the realm of “corporate social responsibility” and sustainability. But we know better! Let’s not let them get away with using this convention as yet another shiny PR opportunity to cover up industry harms and repress dissent. What have we been doing to #DisruptPDAC this year? 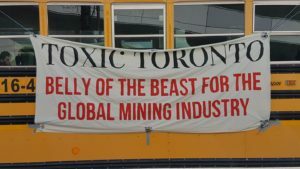 On Sunday, March 5th, over 100 people will be getting on the bus for Toxic Toronto: a bus tour through the belly of the beast with a rally culminating at the PDAC convention to untangle the secret webs of power and money that connect our city to some of the most harmful and toxic mining and extractive projects around the world. Facebook event here. On February 24th we organized a panel called Belly of the Beast: A Biopsy of TO’s Mining & Financial Sectors exploring Toronto’s financial district and the reach of its tentacles throughout the global mining industry.